and find a nice house to live in (and obsessing about the whole thing). From a photo a friend took in Kenya. From a portrait found on flickr, and this time I didn't forget to note the name of the photographer : it's "krakote est point com" on flickr, and the original photo was taken on march 15th. Great pictures here. I especially love the giraffe but you've done a great job on the expression of the lady in black and white. I think the New York rendering is awesome, the color scheme is just amazing. 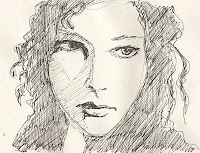 The other portrait, all I can say is that you're really really good :) I am so impressed! the giraffe is great - wonderful colours. Do you know about the one Million giraffe project? I enjoyed looking over the pictures on your blog. 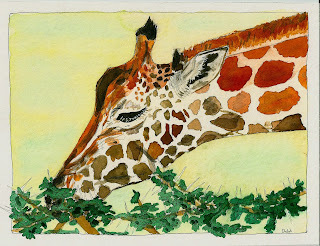 Love the giraffe - great lines and colors. Being a fan of pink, I have to say I love the watercolored purse, too. Your giraffe is wonderful - I love the colouring. Yes, you did pause and enjoy painting the giraffe. It shows. Nice work on the other paintings. That is one fantastic giraffe! I find myself copying your watercolors more and more lately, for practice. These are wonderful! The giraffe looks so contented and engrossed in lunch! Nice portraits too! Fantastic drawings! I especially like that giraffe. Wonderful work! 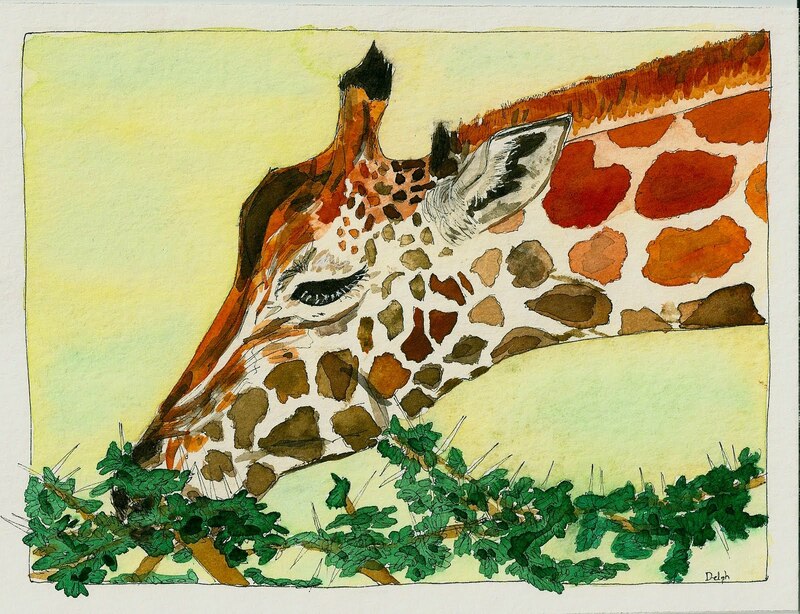 I especially love the giraffe, it seems so peaceful and content munching away. la girafe remporte les votes, normal, elle fait partie du club des animaux super cool. Ton aquarelle est tres belle, les couleurs, la mise en page. 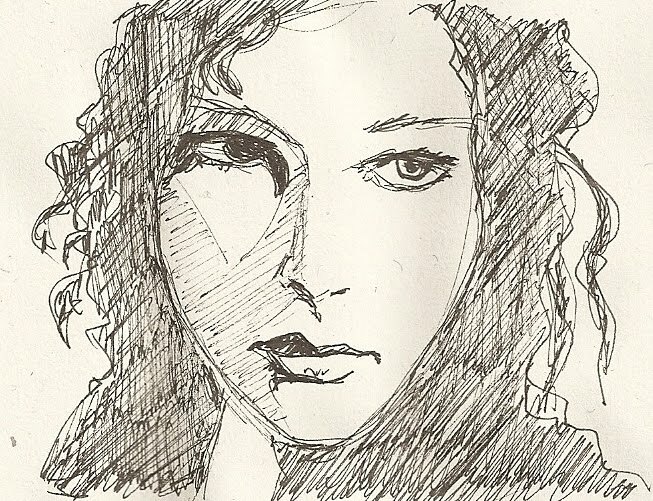 Les deux autres sont tres interessants aussi, j'aime beaucoup les dessins au trait, toujours beaucoup de caractere. bonne chance pour ta vente d'apart et recherche de maison. these are wonderful, but the giraffe rocks! Superb giraffe!! Keep it coming! Glad you're finding art in the midst of your crazy life. The giraffe is gorgeous!